Alpine Getaways has a handful of cozy, rural Crested Butte homes to choose from. Each of our rural Crested Butte homes is located in the quiet countryside, offering beautiful scenic views and all the privacy you could want. 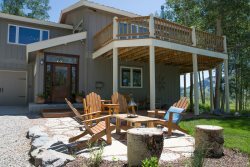 Choose from our River Nest which is located directly on the East River and is pet friendly, CB Treehouse located in Meridan Lake close to Snodgrass trailhead, or either of our two Skyland properties Trent Jones or Aspen Hideaway. Enjoy some of the best skiing and mountain biking in Colorado, as well as all the fun events and activities Crested Butte offers during your vacation stay. All of our rural lodging in Crested Butte can accommodate large groups and are perfect for the whole family!